Water-repelling treatments have been available for quite a while now. However, with growing concerns relating to perfluorinated compounds (PFCs), new research and development had to occur in order to find an environmentally-friendly alternative. After years of development, NeverWet, with the help of their manufacturing partners, Rust-Oleum, developed and commercialized a PFC-free Durable Water Repellent (DWR) formula that repels water, mud, food stains, and other liquids, all while maintaining the texture and breathability of the fabric. Superhydrophobicity is a description used for water-repellent surfaces made of hydrophobic material. While most fabrics do not carry this trait naturally, our NeverWet DWR products create a barrier between the fabric and the liquid attempting to permeate it. Not only is this barrier strong, it is lightweight and breathable; fabrics treated with our NeverWet DWR treatments look and feel the same after treatment as they do before. 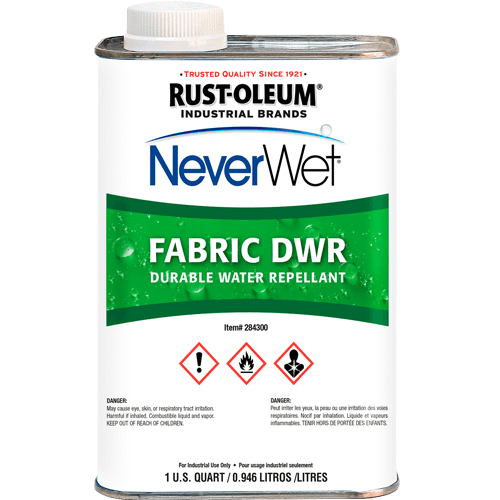 The durability of NeverWet’s DWR products is unprecedented in water-repellent treatments; our solvents can withstand up to 70 home washes before hydrophobicity loss. Our DWR fabric treatments also undergo rigorous shower tests to see what the treated surfaces can endure. The volume of water hitting the surface as well as the force with which the water hits the surface is tested. Our NeverWet DWR treatments proudly boasts its PFC-free formulation, which offers the same level of performance, including exceptional liquid and stain repellency, as original perfluorinated compounds while being environmentally friendly. This combination of features is remarkable, and NeverWet was the first company to meet market demand while overachieving in performance. NeverWet has been dedicated to developing a sustainable, environmentally-friendly product that is compatible with a wide variety of fabrics and surfaces. Now, their patented formula is the most versatile, environmentally-conscious product on the market today! The water-based treatment is applied as a finish at the textile mill, where it is heat-cured during drying. The formula bonds to the fibers of polyester, nylon, cotton blends and more, while still maintaining its original breathability and aesthetics. NeverWet also offers a solvent-based, post-production version where heat-cure finishing is not an option. It is the hope of NeverWet to soon develop this product for consumer use, and will eventually be found on the shelves of your local stores. Want to know more? Visit our website at www.neverwet.com and leave us a message. We can’t wait to get our newest, greatest product out to you and see what sticks – or doesn’t!